What's the point of linking other servers if they still struggle against Blackgate? This isn't a matchup thread by the way, this is a legitimate concern because every week T1 is a blowout in some sorts and I doubt it's any fun. Just look at the other matchups and it's much closer compared to the mess T1 has been for the past couple of months. Anet please do something about how your linkings work or hit the problem of everything that is Blackgate. They’ve stated before that many of the combined servers have a greater population than BG. You can’t fault a server for simply being better (or at least when they bother trying instead of hibernating). That's probably the plan. BG will probably implode if this goes on. In T2 atm. Some people actually deliberately want to stay out of first place in their matchups because they don't want to go back to T1. Craziness. When you get to the point where people are okay with losing because they don't want to go up against the very unfun, horribly lopsided Blackgate you know something is seriously wrong. It's not about how or why BG is 1st, and how long that will remain. They play the game mode to the fullest extent encouraged by ANet, and pride themselves in constantly "being 1st." The problem is that (again for whatever reason) servers find it so awful to fight against BG that they actively tank match-ups just to dodge being in T1 against BG. As it stands, T2 is basically "Tier 1 lite", where people blob around for the first half of the week PPTing and whatever, while the second half is trying to not be the "loser" that gets sent to T1. Something is fundamentally flawed when the majority of people actively want to avoid winning in the game mode that's been set up. One of the reasons that I made this thread. T2 is basically a win for the week if you come in 2nd because coming in first is a death sentence to a week of Blackgate. lol. The other day I jumped on and we were 1st in our current skirmish and people were like "omg! Why are we 1st!" as if it's a terrible thing. That's where we are right now. While some servers don't want any part of T1 and will tank if they make it to T1 no matter what. With lack of real attention to WvW by Anet and the game is going on little over 5 years old now with many people have stopped playing after H.O.T fiasco that was and the game has struggled to make up from that loss of players to date still. So many factors are in play that BG or any other server can't control. So people need to stop trying to blame BG for everything when Mag outnumber BG and still lost couple weeks in a row then Mag decided to give up so they can drop down a tier. You can't fault a server for being better than other servers or have better strategy etc then others or having the willingness to stay in T1. 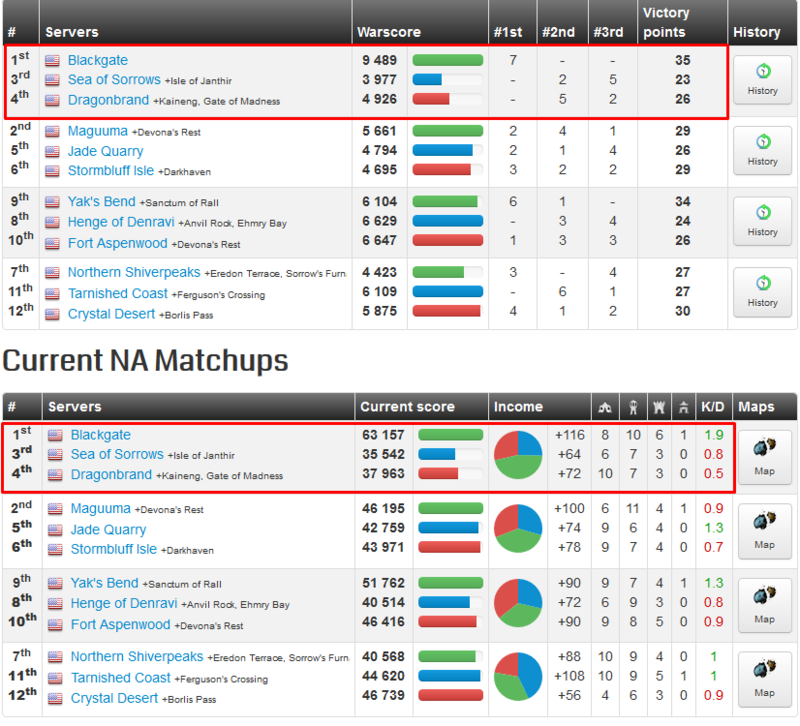 Anet has BG hard locked even though other servers have linked servers and still outnumber BG. So the talk that BG is the fattest server is a joke. Here the Best part the OP is on SOR all the way down in T3 and NOT even in this weeks T1 match up so what's really the agenda here? BG may not have the active population on the books as the other servers, but they have the coverage, that is has always mattered. The core problems of balance are essentially around BG, and Anet falsely opening up the server to allow more people to go in. I'm not going to fault the server for buying guilds (other servers have done it, it's just BG has done it far more). I'm not going to fault Anet. I wonder, if Anet never opened up BG to allow such a large population disparity (and yes those who've been in T1 can clearly see it), would linking even exist? SoR imploded back during Seasons, so I'm not actually sure what point you're trying to make; any server that gets a 3x link is generally pretty dead, which is why we didn't have queues until 15 minutes into reset. Meanwhile, you talk about the game being 5 years old, and argue that ANet finally getting around to patching the use of 3rd party programs only within the last year to get into BG overnight killed the BG population. Ok! Anet cant balance a game modes population if that game mode is losing more players than attracting, simply because the numbers are steadily changing. All they can do is try to manipulate the numbers , which is what they are doing. They need to focus on fixing the issues that drive people away and then find a way to bring new players and vets back. Hmm #bgtears comes to mind during the tournaments, so I should care about this problem other servers are having with BG why? I didn't understand one bit of your post and not going to even try. You must not keep up to speed on the WvW scene. Two major guilds have left Blackgate in the last week alone. BG wasn't even queued on EBG during reset last night. Queues on the other maps were minimal (I was late for reset by about 10 minutes and only had to wait out a 2 person queue on Desert BL). There were only three organized guilds running across all four maps. This is nowhere near what any major server could field a couple of years ago. If other linked servers can't field at least three active guilds on reset night, it's hardly BG's fault. All you need to do is to take a look at the KDR and you'll see the difference in score this week. Not sure what you can read into that. Lots of people (maybe most?) have more than one account, often on different servers (and no, I'm not just talking about spies). I have four. I post on this one, which is my Ehmry Bay account, for consistency but my main WvW account is on YB. So basicly BG players will be PVD'ing most of time, well that's a PRO thing in this game.. Joking asside, that will make more players want to get in BG since its the padron mentality of gw2 playerbase. IF BG plaayers loose interest there already lots to fiill with the transfers. Anet might have created the worse gameplay ive seen in mmo's that players try only to ktrain and not actually fight for free rewards. BG isn't better then other servers though, they're honestly pretty terrible for the most part and can't fight without the QQ pin snipe guild there to kill enemy drivers and some siege and a tower/keep to fall back to since they would rather avoid a fight then do pvp in a pvp game mode. The only reason BG "wins" is because they do have more people and coverage compared to every other server and no one wants to play their dumb ppt game because its a boring snooze fest when for the most part in NA at least people are looking for fights. (trying to pvp in a pvp game mode oh my god!) When you have some of the thickest na right now and the only guild that would fight others has left the server because they didn't like being on it are you really surprised no one wants to be in a matchup with you. And that's just precisely it. In GW2 you get rewarded more for just PvDing then you would for fighting players like in all of the other MMOs I've played. This is what attracts such super casual non competitive players. The fact that there are built in ways to avoid playing competitively, but still win. It's like playing poker but knowing John Doe at the table, is always going to be dealt the winning hand. That's basically what WvW is now. And as we see more and more players left the game mode. Means this type of casual and inclusive gameplay, is very boring to a lot of players. Meaning they are just going to leave for more exciting games, that have developer and publisher support. There are 24 servers and 4 tiers for anet to focus on. So people need to stop trying to blame BG for everything when Mag outnumber BG and still lost couple weeks in a row then Mag decided to give up so they can drop down a tier. Remember, these are three way matches. Very difficult for a server like Mag to win against BG if the third server in the match is not also trying, and as reported by players, no one wants to try. So in that way, yes, can't fault Anet for something the players are unwilling to do. Anet says they've been making server link teams that have more playhours than BG. Now we know that one thing these "pug" teams have going against them is they're not as organized as BG and don't have the experience playing together, but it is also player desire. Can't say exactly I fault players for not wanting to participate against BG though since fighting them tends to be boring, but if people want to beat BG, they do have to play. The other thing is related to not just coverage, but in the way there is coverage. A lot of NA servers are strongest during NA timezone. The skirmishes before NA Prime affect how well NA Prime performs; do they start out at an advantage with objectives or at a disadvantage? What the OP's pictures show is BG very strong during EU and the others servers are not. This makes the NA on those other servers face an uphill struggle when they log in which minimizes how much those players affect the score not only in NA, but in the timezones after NA. Mag didn't really have that problem because Mag's EU tends to be strong. So the way there is coverage on a linked server team can also have an effect on whether they'll have some success against BG and players know this. How about we, the GW2 community, attempt to bring them down legit instead of appealing to daddy Anet to fix the problem for us?? What do you want Anet to do? Start kicking people off Blackgate until someone can actually beat them? Pathetic. This mentality is exactly what's wrong with this community now: too many emotionally frail dimwits who dislike even a moderate challenge. You've all been force fed your easy mode legendary armor and backpacks and you've forgotten how to use logic and determination to solve what is, in my mind, a relatively simple problem. If you actually had the guts to not avoid t1 because it's too scary you would find that Blackgate is absolutely beatable right now. They're tenacious, relatively well organized and utterly ruthless but beatable. Their usual tactics and stratagems are ofcourse quite good but they're predictable nonetheless. They have major coverage gaps and an NA force that can be completely steamrolled under the right conditions. Their two biggest strengths are 1.) They've got one of the last decent OCX guilds left who are willing to run open seemingly every raid and blob everything down and 2.) One of the last decent SEA guilds who are also willing to run open seemingly every raid and blob things down. This doesn't seem to me to be that hard of a riddle to figure out. Given what I've just told you where should one start if one's goal is to legitimately beat BG? I was on JQ for over a year before I transfered down to start a guild on SoR. I'm just bringing up this issue because a lot of people in general from other servers feel this way towards Blackgate. Their two biggest strengths are 1.) They've got one of the last decent OCX guilds left who are willing to run open seemingly every raid and blob everything down and 2.) One of the last decent SEA guilds who are also willing to run open seemingly every raid and blob things down. This doesn't seem to me to be that hard of a riddle to figure out. Given what I've just told you where should one start if one's goal is to legitimately beat BG? I recall BG being relatively weak during late PST/early OCX. If another server had a sizeable force during that time they could paper everything upgraded and put BG's OCX and SEA on the backfoot. A third server also hitting BG during this time would assist. BG's NA only seems strong because they start out their skirmish with upgraded objectives which are easier to defend than paper stuff. So, your solution is to complain? Late PST/OCX is when KNT usually forms up so this "sizeable force" would need to be good enough to deal with them. They're definitely beatable but they're probably the best fight guild BG has left. But yes if there were any PST/early OCX forces left that could roll over KNT that'd probably be the end of Blackgate because that's usually where they start to generate their momentum. Also if you can paper them before NA even starts they struggle enormously. They are particularly weak during EU. All they really have during EU is NINE. NINE is ok but not as tough as KNT. This, in my mind, is the first and most easily exploitable weakness given that there are quite a few active EU guilds left playing the game. It's not healthy when multiple servers in T2 don't want to go to T1, so they purposely tank to avoid a matchup with Blackgate because they can't match them in coverage even with a linked server or multiple linked servers. I honestly don't really know a solution to this problem so my idea is to have someone at Anet notice that a large part of the WvW community doesn't enjoy how unhealthy T1 currently is, and for them to think of a solution to fix things. One of the challenges other servers that have been open will face and likely are facing is all new players from the expansion will go to them. Call BG players bad, call them unwilling to stick out hard times, call them siege kittens, whatever. But what separates them right now is experience of the group as a whole. New players need to be developed and 'trained'. And you need to be willing to PPT. Here's the thing: most aren't doing that. And most of the ones with coverage don't want to try. Either because they 'just want fights' or because they can't leave whichever server is NOT BG alone. I've been saying similar things for a long time. 5 people outside of NA prime can make a bigger difference in scoring than 50 during prime. It's not a population problem, it's a population distribution problem. Many times BG will be undermanned during NA prime, but that's easily rectified by a few people in OCX or SEA during non-prime hours. There's nothing magic about BG. The guilds range from fair to very good (pretty much the same as other guilds in T1-T2), but the PUGs are not nearly as good as they were a couple of years back. Mag PUGs are and have been better for a very long time. BG is just better organized and has the desire to do what it takes to win. Most of the people on the forums do not, and would just prefer make excuses or whine. It's not healthy when multiple servers in T2 don't want to go to T1, so they purposely tank to avoid a matchup with Blackgate because they can't match them in coverage even with a linked server or multiple linked servers. I honestly don't really know a solution to this problem so my idea is to have someone at Anet notice that a large part of the WvW community doesn't enjoy how unhealthy T1 currently is for them to think of a solution to fix things. You haven't noticed the once per week or so threads complaining about BG? its because no matter how many people move to your server or how many servers u get linked to if the players in those servers doesnt play WvW then you all will still lose to BG over and over again. i seriously wish you guys play w/ BG server and see the big difference in mentality and playstyle of any BG pugs. BG pugs BTW not BG guilds runs BG server. BG pugs runs META build, have proper food etc. most servers have players who ran zerker and viper pve builds. having blobs/zerg respond to few aggressor. cmdr or scout dont realize this that if u responded to 6 people trying to claim your tower by moving your zerg across BL instead of sending 6 -10 only players to deal w/ it shows how bad most of your players are. hey are particularly weak during EU. All they really have during EU is NINE. NINE is ok but not as tough as KNT. This, in my mind, is the first and most easily exploitable weakness given that there are quite a few active EU guilds left playing the game. I think their EU is weak against Mag's EU and strong against other server teams' EUs. 1.) Yeah BG pugs tend to run something approximating a decent zergball WvW build. This usually involves running very tanky though so the pug fights get easier as the skirmishes get smaller because very few of them can actually do enough damage to kill anything. So there's a tradeoff to having so many people building for giant zergball fights all the time. Still I get what you're saying running high risk builds effectively takes a lot of practice. Even after thousands of hours some days I can't handle running as glassy as I do. 2.) 100 percent almost no one's gonna rotate for a "6-10 at a tower" call because it's usually a complete waste of time. If you go with enough people then 8/10 times BG will just peace out so the odds of getting a decent fight are low. Also if it involves porting out of EBG then forget it because it takes 30 minutes to an hour to get into EBG in the first place. That's because Mag actually has some EU. For most NA servers it seems EU has become a total deadzone so having even one guild consistently play the timezone can make a big difference. Imagine if someone could consistently queue multiple maps during EU though. No one could compete with that on NA. No one wants to create super servers anymore to face them. Anet also locks the servers that have any chance to fight them. So the only way for those servers to even build to match them would be through links. But then Anet's use of links is not consistent, JQ lost their link and dropped, Mag gained a link after 8 months of being locked and went back up. So what else can players do? bandwagon to an open server to go face them? BG SEA CMD was untag run with 30 ppl but DB SEA dodge fight ( TFV AZ ) ,SoS SEA dodge fight (RF) "
i can tell you BG OCX/SEA CMD both untag raid yesterday. AND know you BM PPT ???? There might be some population disparity with the servers currently winning their skirmishes. Obviously just one-twelfth of the 24-hour pie, but its a decent enough snippet. Even adding up all of the servers' points in each tier its quite obvious which ones are more active flipping objectives, killing dolyaks, snagging sentries and all of those other things outside of killing enemy players and passive ticks that generate points. My point being its not even close. edit- T3 is broken for some reason, each server is actually 5~6k. Still, half of what Blackgate is ticking. It is what I sayed. "So the way there is coverage on a linked server team can also have an effect on whether they'll have some success against BG and players know this." On a serious note it probably is gonna take a merger of Mag and JQ. Mag needs someone like Cloudfly who will PPT all day every day. Also we could try paying EU ppt guilds to come over and go ham.